I’m happy to announce that indicators have been ported to gnome-panel 3, thanks to Jason Conti for the patch and Ted Gould for merging it. I’ve taken the opportunity to update gnome-panel’s default layout to include the “indicator” status menus and the show desktop button instead of the upstream clock and notification area. I for one really appreciate the Ubuntu design work on the status area and believe it is far better than the classic notification area. The theming is still broken (see the two different gray backgrounds in the top panel) but I expect that will be fixed in the coming weeks. Patches are appreciated. And the window switcher in the bottom has barely readable light gray on dark gray. I don’t remember if that’s a new problem due to the intense GTK+ theme changes this cycle or has been there for a while. I normally run GNOME Shell or Unity and run Classic just enough to help with its packaging. Anyway, the Classic desktop had some issues in 11.10 but I’ll be happy to recommend 12.04 for fans of the GNOME 2 style. why block your hostname? Seems odd. No good reason but it sounded like a good idea at the time. Excellent! It’s really great to have this, and I appreciate the new defaults, too. I’m a gnome-classic fan and there is still an applet failing to display all the workspaces: only one is displayed, and no way to set more, needs to force and (re)load metacity to get them all. Not a big deal but should work better. Perhaps you’re being hit by bug 826089. If you log in to GNOME Classic with effects (Compiz), the workspace switcher works fine (as in my screenshot with 4 workspaces in a square). Does this mean that I’ll have the gnome2 style clock applet? The GNOME 2 style clock (assuming you mean the one with weather and the daylight map) is not enabled by default but it is included if you want it. You could install indicator-applet and indicator-applet-session and remove indicator-applet-complete (you don’t have to uninstall it, just remove it from the panel). Doing that will show all of the indicators except for the clock indicator (so you can use the GNOME one instead). Disappointingly, that configuration doesn’t scroll horizontally near as nicely as with the complete indicator applet, but it does match the Ubuntu 10.04 behavior. For those interested in this, how do you install it? Can you get it from the Ubuntu Software Center? Yes, it’s in the Software Center. Install either gnome-panel or gnome-fallback-session (they both install the same thing in Ubuntu). so g-s-f have not been updated yet, i am right ? My system use g-s-f as i’m logged as gnome-classic (no compiz/unity), but the two packages are installed; As you said “installed either” does it mean that only g-s-f should be installed ? I does not find comments in synaptic dependencies about possible conflict with gnome-panel. gnome-session-fallback depends on gnome-panel and gnome-panel depends on gnome-session-fallback. If you have installed one, you’ll automatically have the other one. The version number of gnome-panel is the important one as “GNOME Classic” is basically gnome-panel. gnome-panel has been failwhaling lately though. Indicator support for GNOME panel 3 finally landed a few days ago, so that part is new. I ran gnome-panel in Precise most of the weekend without crashes so I’m not sure what wasn’t working for you. Just tested it, and it’s really coming along. It works much better with Radiance than Ambiance, though there’s still a noticable difference with the indicator applets background. A bigger problem with Ambiance is that the text on the switcher is almost unreadable. With Radience, everything works well. It just looks slightly unpolished. Perhaps it would be a good idea to start an Experience Team for this effort? Too *BLEEP* late. Ted Gould dropped the ball. Fallback session had been non-functional for one and a half releases because of this. I’m using Gnome Shell now. Unfortunately also that is degraded in many respects due to the oftentimes uninspired and counter-productive Ubuntu customization and theming and cruftization patches, which are so numerous that important packages like gnome-control-center are held back on 6 months old versions. Whatever happened to the stracciatella idea? It means vanilla Gnome with just the absolutely necessary Ubuntu chocolate sprinkles. Not this gratuitous ladling on of pointless high-calorie branding sauce. Wow, it’s just software, no need to get this angry over it. How is GNOME Shell on Ubuntu degraded? 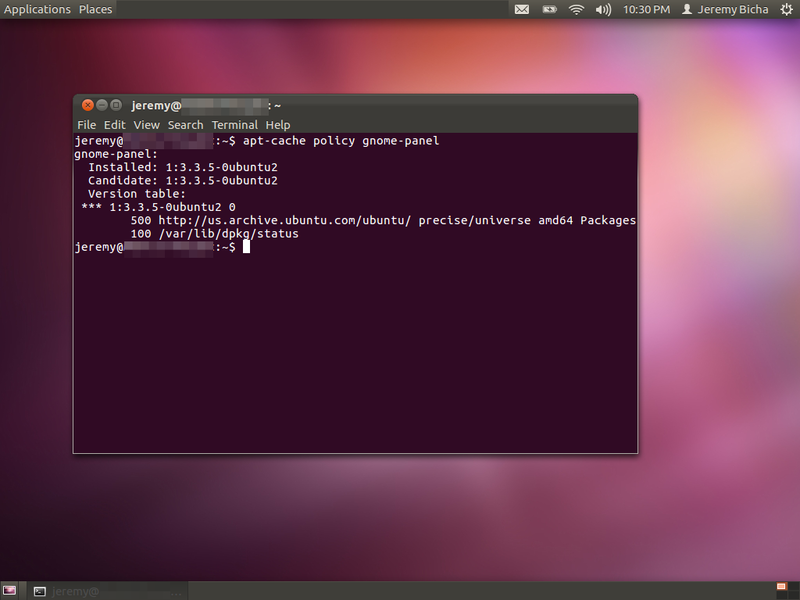 Ubuntu doesn’t really patch GNOME Shell. 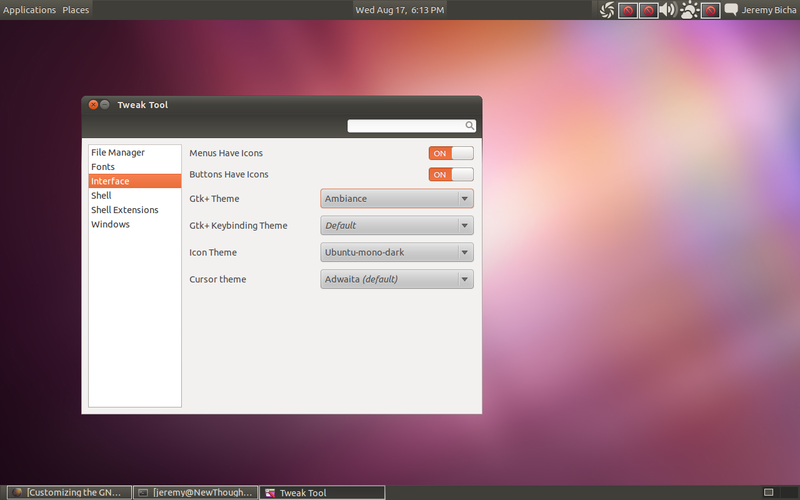 Last cycle, we shipped gnome-panel without Ubuntu customization patches and it was pretty awful. The default notification area just isn’t adequate. I don’t understand how you can be upset at the indicators not being including for GNOME Classic and upset at Ubuntu modifying vanilla GNOME. Eh, nevermind, sorry. I’m merely upset when it’s not functional. Gnome-panel didn’t work properly because things like nm-applet only worked with indicators, but indicators were not available because they remained unported. So it looked pretty degraded from before. Now Gnome 3 is partly up-to-date and partly 6+ months old and some things don’t work properly, e.g., media-keys. The delta is just getting bigger and bigger and I often don’t see the point. It’s not modular anymore when there are intrusive patches everywhere that co-depend. For instance, I looked at gnome-control-center today with it’s 30 or so patches. Why does it need category headers and an additional top-level of icons. It’s pointless. It never gets upstreamed and widens the gap between up and downstream, technically and socially. I’m thankful for Gnome3 PPA and ricotz/testing, because those give a hint of vanilla flavor. The applet prints out your full name, and you already know your name, so it just takes up space and clutters the screen, especially if you have a long name. It should just show the icon without the name.